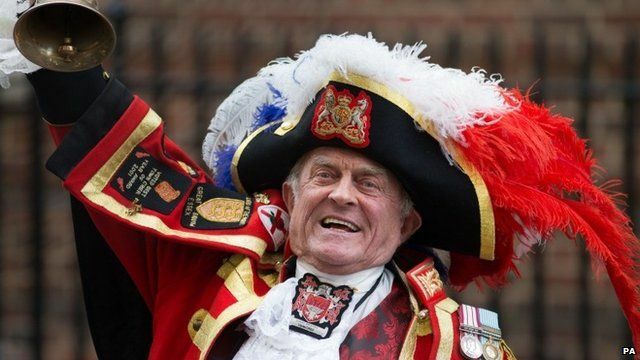 Town crier announces royal birth Jump to media player The birth of the Duchess of Cambridge's daughter in London was announced by unofficial Town Crier Tony Appleton. Royal baby: 'You can hear the cheers' Jump to media player The Duchess of Cambridge has given birth to a daughter in a hospital in central London. Aerial video of Palace well-wishers Jump to media player Aerial video shows crowds outside Buckingham Palace and a message on London's BT Tower as the Duchess of Cambridge gives birth to a baby girl. Royal baby official notice at Palace Jump to media player A formal bulletin confirming that the Duchess of Cambridge has given birth to a baby girl is displayed at Buckingham Palace. William and Kate welcome baby girl Jump to media player The Duchess of Cambridge has given birth to a daughter in a hospital in central London. The birth of the Duchess of Cambridge's daughter in London was announced by unofficial Town Crier Tony Appleton. The baby - who is fourth in line to the throne - was "safely delivered" at 08:34 BST, the palace said in a statement. The Duke of Cambridge was present for the birth of the baby, who weighs 8lbs 3oz.